When the clouds open up and it suddenly starts raining in the middle of a round, don't think of yourself, think of your clubs. Before you put up your umbrella or dig your rainsuit out of your bag, be sure that the top of your bag is covered. When you can't get a decent hold on the club, you can't put a solid hit on the ball. An amateur golfer friend of mine actually carries a chamois cloth to rub down his grips - that's a great idea - and I'm frankly surprised I've never seen it on the Tour. Second, when the ball and turf are wet and the grooves of your irons are filled with water, don't expect to put much backspin on the ball. You'll get a semi-flyer shot, but you won't get more distance than usual because the weight of the rain will cancel the spinless flight of the ball. In fact, on approach shots it's generally wise to take one club more than normal and make a controlled, balanced swing to guard against slippage. 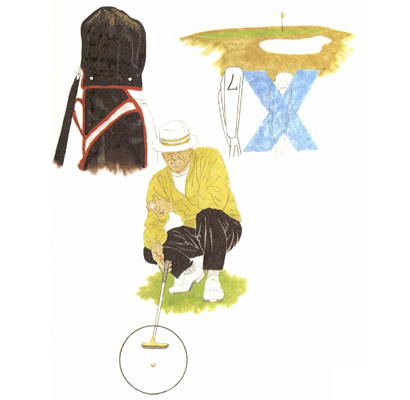 My final tip is on putting. When a ball sits in the rain for more than a few seconds, its dimples fill up with water, and the result is that you will not be able to make clean club-to-ball impact. It will slip and slide both on impact and during its initial roll. So do yourself a favor and keep the ball dry for as long as possible. This means lining up your putt with a marker in place instead of the ball. Don't set the ball down until you're ready to address and stroke the putt.